A young woman moves with her family to a small island off the coast of Japan only to find herself caught in the midst of some genuinely weird happenings. In making the transition from video game to big screen movie, Forbidden Siren is unfortunately more terrible than it is terrifying. Review by Calvin McMillin: Based on the popular PlayStation 2 title of the same name and timed for release alongside the game’s first sequel, Forbidden Siren is yet another movie – like Resident Evil and Silent Hill before it – that's based on a game that made somebody think, “Hey, this might make a good movie.” And with its foreboding setting, young protagonists, and some creepy-as-hell zombie-like baddies, the original video game certainly does have all the earmarks for a solid horror flick. Unfortunately, the filmmakers behind this sloppy movie adaptation aren’t able to muster anything remotely as scary as the source material. Forbidden Siren begins promisingly enough with an opening crawl that suggests that the events of the film may be connected to the infamous and still unsolved disappearance of the crew and passengers of Mary Celeste and the entire colony of Roanoke Island. 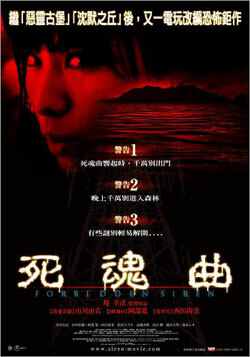 Like the second video game Forbidden Siren 2, the movie is also set on the fictitious Yamijima Island. After a brief sequence set way back in 1976, we then flash forward to the present day just as middle-aged writer Shinichi Amamoto (Leo Morimoto), his beautiful daughter Yuki (Yui Ichikawa), and her younger, presumably autistic brother, Hideo (Jun Nishiyama) have arrived on Yamijima to take in some much needed rest and relaxation. Yuki assumes that the change of scenery is meant to improve the condition of little Hideo, but soon enough, there’s a strong, if fleeting suggestion that it is actually Yuki who is the family member with the problem. Although the Amamotos are looking to get away from it all, they’re not alone on the island. There are a handful of other residents, but for the most part, they don’t exactly give Yuki and her family a warm welcome. In fact, the locals all come across as a little batty – that is, with the possible exception of Dr. Minamida (Naoki Tanaka), a young man who’s friendly with the Amamotos and seems to be taking more than a passing interest in Yuki. In any case, the rest of the villagers seem to be acting awfully secretive about something, and it’s that something that Yuki aims to discover. Her amateur sleuthing leads her into all kinds of bizarre situations. There’s some weird cultish ceremonies led by the villagers, a mysterious woman in a red hood (Mai Takahashi) wandering the countryside, and the ever-present graffiti bearing the words “dog” and “live” scrawled over the various locales. If you can figure out the significance of that last occurrence, you’ve probably seen your fair share of horror flicks. Or you’re good at anagrams. The key piece of information that Yuki learns is that she should never under any circumstances go outside when the siren goes off. What all this might be connected to, Yuki eventually discovers, is an old island myth claiming that the villagers once caught and ate a real live mermaid. Right before its life force was extinguished, the creature allegedly bellowed a screech of pain - could this be the siren call that everyone has been warning her about? With her brother’s condition worsening, the islanders going crazy after dark, and even her dad acting weird, Yuki realizes she has to put a stop to the siren’s curse. Only that’s a lot easier said than done, considering that there’s a couple surprises left in store for poor Yuki. I admit that I’ve only played a bit of the American edition of Siren, but what I did play was both creepily atmospheric and intense – two qualities sorely lacking in this tepid adaptation from Yukihiko Tsutsumi. At certain moments, the film does try to replicate the look and feel of the original game, even so far as to create similar events to what occurred in the first PS2 game. Unfortunately, the movie version of Forbidden Siren is so devoid of any palpable sense of tension or dread that the whole thing just feels incredibly corny and fake. Yuki’s reactions often ring false, as she rarely does anything that a normal human being would do when faced with scary situations such as those in Forbidden Siren.